Difficult to make a muslin so I used finished garments measurements as my guide. 1. Shortened at hem 4 inches. Next time I would shorten 3/8” between bust and shoulder and also 1/2” between waist and hips. 2. It is a an easy sew but important to read directions carefully. 3. Pattern does not call for stabilizing pockets nor under stitching – I will be sure to do that next time. 1. This is an okay top/pattern. Every piece but one is cut on a single layer – lots of pieces for a whole lot of nothing! 2. I did not add back pocket or tab. The seams were serged and topstitched rather than a flat felled method as pattern directs. Fringed Skirt– Angela Wolf, The Fringed skirt AW 3106, Wool blend plaid, Bemberg lining. 1. This is one of my favorite skirt patterns but only the second time I added the fringe. I like her method for the fringe – stitching a folded piece of fabric to ws of skirt. You have 3 layers of fringe which gives the skirt more depth and coverage. I also Like her pattern for lining. *	It is a short skirt -18” – I did add two inches to length. 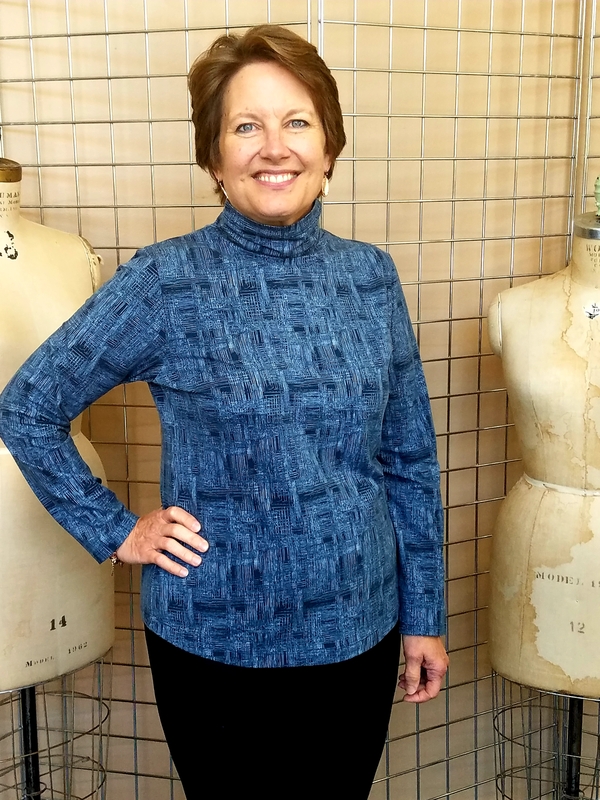 Turtleneck Top – Kwik Sew 4069, long sleeve, cotton/lycra ribbed knit. 1. This is a great pattern. I just did a lot of shortening: shortened turtleneck width , sleeve length and body length by two inches before cutting out pattern. 2. Shortened sleeve length by 4 inches. 3. Blinged midriff with crystals using ScanNCut for rhinestone template. 1. 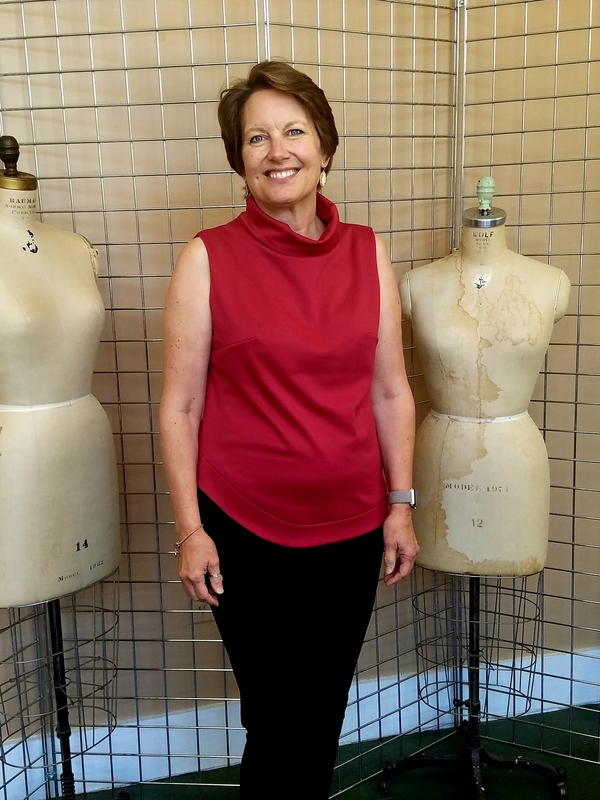 Sewed per pattern except reshaped collar. 2. Shorted and shaped waist to fit with moto jacket look. 3. Cut vinyl iron on transfer from ScanNCut. 2. Love the design lines-tucks in knees and pockets give it some edge. 1. Fabric was gifted-fell in love with it, but smelled musty. Vinegar bathub solution. 2. Fabric caused a lot of problems-broken needles, raveling, etc. a) Used size 18 needles and changed frequently. b) Used elastic stitch to secure seam allowances and prevent fraying. -serging raw edges didn’t work. 3. Omitted binding on edges (ballooned armholes) and decided to fringe instead. 1. Pattern is cut on bias so with linen knit being off grain=perfect match. 2. Calls for 1” CB seam in directions but pattern markings are at 5/8”. 3. Front neck facing “will stay down on its own”-no way! 4. Didn’t stabilize shoulders but did stabilize neck. 5. Didn’t stay stitch armhole. 1. Quick sew, pretty good fit. 3. Mitering corners on hem-trace stitching lines for your size-confusing but works well. 1. Added CF seam-like the vertical interest. 2. Neckband was too long by about 1.5”. 3. Might be fun longer too. 1. Seems to be a theme for the big sleeve this year. 2. Made to pattern-pretty big but fun. 1. Dart needs to be shorter. 2. Great method for stitching band on-minimize bulk. 3. Interfaced armhole facing-maybe not necessary with ponte. 1. Not the looser fit “sweater” that I was looking for. 3. 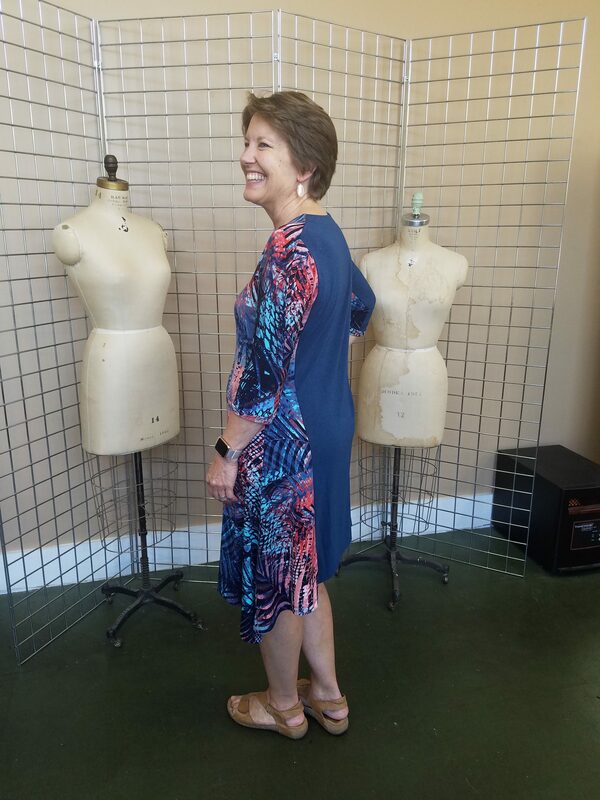 Added assymetrical hem for interest. 1. Easy neck that gives a neater fit than a funnel neck.